Your Election 2015 PositionDial: Do you care? Do you care who wins in the upcoming General Election? According to a study released over the weekend by BBC Newsbeat – 60% of young people do – but less than half are registered to vote. There’s still time, the deadline to register is 20th April and it takes five minutes. Where do you stand, and who matches? So far 20% of active visitors to PositionDial are getting their Election 2015 PositionDial – which gives you your top party matches. Today we launch a newly redesigned PositionDial – as we start preparing for the impending UK General election. Check out our new antibod feature (see the opposite to your worldview) – you get the best out of this if you sign-in. Tomorrow the much anticipated Innotech Summit takes place – on legislating for LulzSec: privacy, data & policy. Still time to get tickets! We’re proudly partnering with Innotech to help everyone engage on key issues covered by the Summit, first of all online voting. 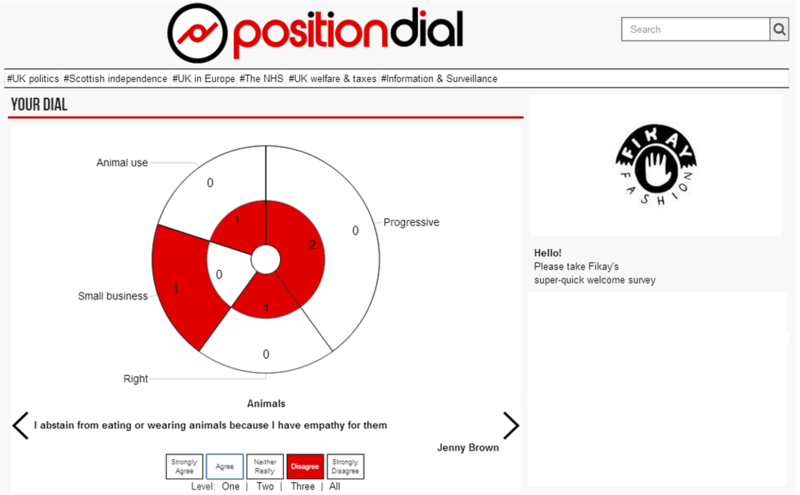 You can work out where you stand via an embedded PositionDial experience (including videos) over on the Innotech website. (And don’t forget to register with us to store and keep building your PositionDial). Watch this space for more on our collaboration with Innotech. 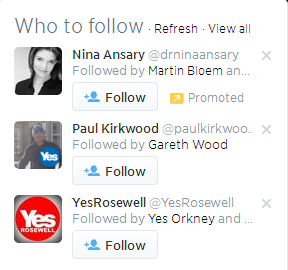 What’s your #IndyRef filter bubble? Is there an #IndyRef filter bubble, and does this matter? It’s early days for PositionDial and we’re building a core audience of people (mainly in the UK to start) who have a position on the big issues. We try really, really hard to follow and bring in members and voices on all sides of the spectrum. Perhaps understandably, from the beginning, Scottish Independence has been one of our hot topics. And it has been the ‘Yes’ crowd who has engaged with us most on Twitter (although this piece saying Tony Benn hoped Scotland would remain part of the UK, has been one of the most popular we’ve shared). Today, this is our recommendations. Love Twitter – don’t want to knock it. But can there possibly be more proof that the filter bubble is real, and we are all in it, even when we’re trying really hard not to be? And what does this mean for democracy in a debate of such importance? Shouldn’t we actually be following and listening to people who don’t agree with us all the time, too? Right. I’m off to seek some undecideds , some “No thanks-ers” – and even some Naw-ers. I’ll tell you on Twitter if it works…! We get quite a few people having loads of fun playing around with their PositionDial but not quite understanding what the inner versus the outer circles mean. Awkward. And what’s in the middle, you ask? So sorry it’s not been super-clear. Here especially for you is a diagram to explain how it all breaks out. We’re also throwing it up on the about page. We’ve made an update today to make it easier to keep track of reading / watching the different sides of the story via PositionDial. You’ve told us seeing different perspectives in one place is what you want most. From today you will be able to see how many you’ve seen, easily, via a tick top left on the media window of items you’ve visited. We have also introduced a new red arrow icon to show when a media item is viewable offsite, rather than on PositionDial. The red arrow appears top right on the media window. You can find out more about why items are shown on or offsite in our FAQ. And as always do keep your feedback, media and blog suggestions coming! PositionDial live at the Fikay Fashion Foundation Launch! PositionDial proudly supported the recent Fikay Fashion Foundation launch. Guests interacted live throughout the night at a special PositionDial page created for the event. If you’re interested in engaging your event guests via a custom PositionDial experience please email me – mariam @ positiondial.com.